Jellyfish are extremely old life forms that have drifted along on ocean currents for millions of years, even before dinosaurs roamed the Earth. I’ve always been fascinated by their alien-like forms, these abstracts in motion. This new series of Jellyfish Sculptural Drawings is based on this lifelong fascination. These drawings were not copied from photographs or traced. I studied the jellyfish forms and then put the pictures away. I created my creatures from residual memory; in reality they are an idea of jellyfish. Each is a surprise; no two are ever alike. The piece tells me what it needs — it’s a dialogue between the idea, the piece as it progresses, and hand/eye coordination. It may surprise people to learn that there is no erasing. My material—an oil-based ink— impregnates the roughened frosted surface as I draw, so if an accident happens, I have to work around it. The resin I use also cannot be erased as it alters the frosted finish permanently. These challenges often lead to the best pieces, perhaps because I thrive on problem solving; to me the problem becomes an inspiration and invitation to experiment and invent. Also, the work is highly detailed and time-consuming as each “line” in most of the work is actually a string of hundreds of thousands of dots made with a superfine pen the size of the head of a pin. Some of these works take weeks to draw and paint. I’ve become known for my ink and resin works on acrylic panels. 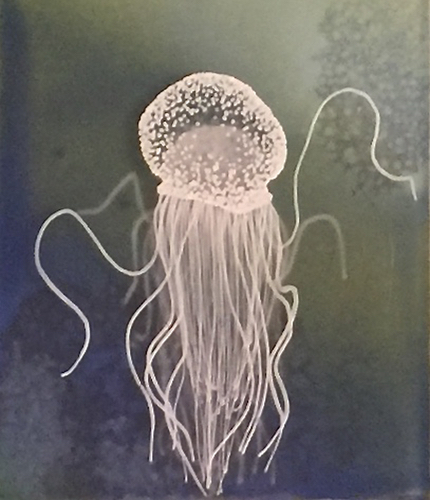 These materials lend perfectly to this new subject matter where light and shadow mimic the diaphanous nature of the jellyfish and turn drawing into dimensional sculpture.